Designation: Department of Neurosurgery, Federal University of São Paulo. List of Author(s): Prandini MN, Nonato MB, Lois JV. Copyright: © 2018 Prandini MN, et al. This is an open-access article distributed under the terms of the Creative Commons Attribution License, which permits unrestricted use, distribution, and reproduction in any medium, provided the original author and source are credited. Hippocampus is an anatomic structure located inside the temporal lobes. It is and an important component of the limbic system and considered the main place of memory. It plays, also, an important role in the visuospatial memory. The healthy aging process is accompanied by the decline of physiological functions as well as some cognitive abilities mainly the ones related with episodic memory, the principal function carried out by the hippocampus. In senesce or in cases of pathological process, some anatomic alterations in neural structures may be encountered such as the reduction of the cerebral volume as a whole. Therefore, one of the principal challenges in clinical practice is to separate the normal to the pathological cognition when occurring in old aged people as well as in patients suffering from diseases located in the hippocampus. The temporal lobe epilepsy and Alzeimer’s disease can be here included. Therefore, it is mandatory to determine the limits of what is normal or pathological when evaluating the size and volume of hippocampus. Recent researches demonstrate that the hippocampus shows a volume reduction in late adulthood and that this reduction has a close relationship with cognitive decline. Besides the hippocampal sclerosis has already been connected with the Alzeimer’s disease. The neuroimaging is crucial in determining the normal pattern for the size of hippocampus. Thus, the need for a more detailed observation regarding the main initial symptoms and structures initially affected in the disease, based on neuroimaging, may be helpful in detecting early and precise diagnosis. Hippocampus, Alzheimer’s disease, Behavior, Neuropsychiatric symptoms. Historically, the hippocampus was first described by the Venezian anatomist Júlio César Aranzi in 1587 . It is an structure located inside the temporal lobes. Under a macroscopic view, the temporal lobes are located below the lateral ventricular system. As characterized by Rogachesk et al. and Barbosa, the hippocampus is positioned on the floor of the temporal lobe, below the cortical surface, measuring about 4 to 4.5 cm in its longitudinal diameter [2-4] Figure 1. Anatomical location of the hippocampal structure in the human brain (arrow) Source: UNIFESP Laboratory of Neurosurgical Techniques. Figure 1:Anatomical location of the hippocampal structure in the human brain (arrow) Source: UNIFESP Laboratory of Neurosurgical Techniques. Performing important roles in declarative memory (ability to store and evoke everyday facts such as names and events) and spatial navigation, the hippocampus and surrounding structures in the medial temporal cortex are necessary for the formation, consolidation and evocation of episodic memories [5-9]. Together with the structures that make up the Limbic System, which are the Cingular gyros, Para-hippocampal gyrus, Amygdala, Septal Area, hypothalamus, Anterior Thalamus Nuclei, Habenular Nuclei , the hippocampus participates actively in human actions and behavior. It has already been described that hippocampal alterations can be caused by stress, since it is a structure that has prolonged ontogeny, persistent postnatal neurogenesis and high levels of glucocorticoid receptors [11-13]. In addition, depression is also associated with small hippocampal volume in several studies [14-16]. According to Barnes et al the “late depression” doubles the risk of Alzheimer’s disease , evidencing that brain structures have too many complex and profound connections which need to be better elucidated. Alzheimer’s disease (AD) is the major neurodegenerative disease of aging, affecting about 5.2 million patients in the US with a predicted prevalence to triple by the year 2050 . AD affects not only cognition but also mood and the behavior observed in the majority of AD patients who develop neuropsychiatric symptoms . Defined as a syndrome involving progressive decline in various cognitive domains, such as memory, language, gnosis, praxis, and executive functions, impairing the individual’s social and occupational functioning , Alzheimer’s disease (AD) has a number of behavioral changes and psychological disorders. Neuropsychiatric symptoms as depression, apathy, aggression, restlessness, sleep disturbances and psychosis (delusions and hallucinations), are recognized as fundamental characteristics in clinical practice in AD [21,22]. The importance of directing the study to the volume of the hippocampus is based on the steps in which the brain regions are affected, according to the pathological progression of Alzheimer’s disease. Thus, when aiming at early diagnosis, in addition to the clinical symptoms, the focus of the imaging exams should be directed to the hippocampal region, initially affected by the degenerative process. Only a few studies have established the relationship between macroscopy of the hippocampus and AD in the literature [23- 25], probably because of the technical difficulties involved in the study of this region and in the absence of determination of a mean volume of the structure in humans. In 1937, James Papez proposed the circuit consisting of the rotation of the Cingulate gyrus, hippocampal, hippocampus, fornix, mamillary body, anterior nuclei of the thalamus, back to the cingulate; it constituted the basic circuit of emotions [26,27]. This hypothesis was amplified by Paul MacLean, in 1949, who proposed the concept of the visceral brain, consisting of the rhinencephalon (olfactory and paraffin-shaped structures and areas, cingulate gyrus, Para hippocampal gyrus and hippocampus) . Alzheimer’s disease (AD) is a progressive neurodegenerative disease which is featured by a decline in cognitive function, progressive loss of memory, and language [29,30]. It may be seen in AD that almost all patients are affected by neuropsychiatric symptoms [29,30]. Although little is known about the mechanisms of depressive symptoms in patients with AD, they are very common, and significant psychiatric complications affect these individuals in 30% to 50% . The hippocampus is considered the main structure related to episodic memory deficit [32,33] and is one of the principal regions studied by the pathology in AD [34,35]. As the disease progresses, the functional connectivity of the hippocampus manifestes some kind of reduction like other regions of the brain. There are indications that AD affects the so-called default mode network (DMN), a circuit that includes the posterior hippocampal, cingulate, temporal and parietal regions, which is active when the person is not focused on external stimuli, when the brain in resting state, but awake. With the network damaged, so far, the literature cites that the cognitive deficits that appear early, in particular the executive dysfunction . Much of the evidence reported in the literature confirms the hypothesis of a disease model reported by Jack et al , associating hippocampal atrophy with neocortical atrophy and cognitive decline, and it is up to other researchers to investigate this structure in the future. To date, the scientific community accepts that desease develops when the patient is still cognitively normal, when some authors call it a ‘pre-clinical stage . At some point there is sufficient cumulative brain damage for the manifestation of symptoms, initially with cognitive impairment, the so-called mild cognitive impairment (MCI). This condition is characterized by a slightly impaired memory with a relative preservation of functional activities, but they do not fit the dementia criteria . The hypothesis that the progression of atrophy is not uniform and may vary according to the stage of the disease is advocated by several works. Leung et al  found a higher rate of atrophy in the hippocampus of patients who already had MCI and subsequently converted to AD (MCI-c) than in patients in whom MCI did not become AD (MCI-nc). On the other hand, in another study , the authors evaluated the rapidity of hippocampal atrophy in patients and observed that the acceleration rate in MCI-c patients (0.22%) is small, when compared with the rate of atrophy in patients MCI-nc (approximately 3.5%) in which suggesting that the transition to pathological losses observed in AD occurs slowly. Because of its connectivity with the limbic system, in addition to cognitive functions, especially in memory and learning, the hippocampus also plays a role in motivation and emotion [42,43]. Some authors mention the potential collaboration of the structure in mediating the relationship between helplessness and depression  and resistance to stress, regulating gene expression in the hippocampus . From structural magnetic resonance imaging (MRI), the volume of the hippocampus was measured, and it was observed that it decreased rapidly in patients with MCI who progressed to AD, strongly associated with imminent clinical decline . In figure 2 a hippocampal atrophy, can be seen (arrow). MR Coronal T1-weighted MRI scans of control (left) and patient with AD (right). 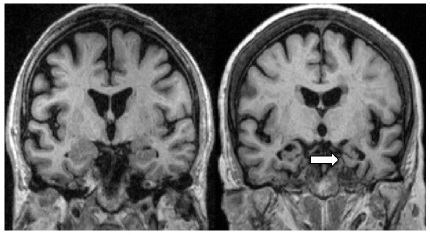 The patient with AD shows atrophy of the hippocampus (arrow). Source: Scheltens P. Imaging in Alzheimer´s disease. Figure 2:MR Coronal T1-weighted MRI scans of control (left) and patient with AD (right). The patient with AD shows atrophy of the hippocampus (arrow). Source: Scheltens P. Imaging in Alzheimer´s disease. Many publications regarding to behavioral changes always associate the presence of disfunction of hippocampus with apathy, another common symptom in patients with AD, defined as lack of interest and initiative in behavior in general. It has been related to the increase in arterial perfusion of the hippocampus and the temporalis [47,48]. In an analysis of the relationship between agitation and severity of the symptoms of aggression over time and regional cerebral atrophy using MRI, a significant atrophy of fronto limbic regions, right posterior cingulum and left hippocampus could be observed Figure 3. There is enlargement of the cortical sulci. Hippocampus and cortical atrophy. More marked hippocampal atrophy can be seen on the right side. Source: UNIFESP’s Laboratory of Neurosurgical Techniques. 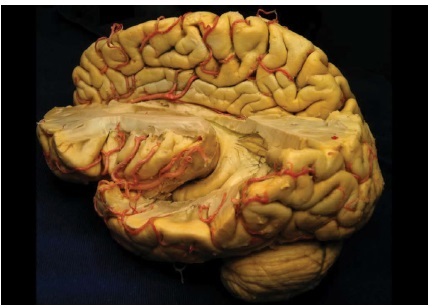 Figure 3:There is enlargement of the cortical sulci. Hippocampus and cortical atrophy. More marked hippocampal atrophy can be seen on the right side. Source: UNIFESP’s Laboratory of Neurosurgical Techniques. It may be stated that a great number of behavioral changes have direct or indirect correlation with the hippocampus. Although many methods have focused on the development of different hypotheses and etiologies for the cause of Alzheimer’s disease, since the progression of the disease seems to be influenced by some other factors such as genotype, gender, age differences etc. the hippocampal volume reduction seems to be a constant finding. Thus, a more detailed observation regarding the main initial symptoms and structures initially affected in the disease, based on neuroimaging may be helpful in the detection of an early and precise diagnosis. The information here presented can be useful in correlating behavioral changes such as depression, apathy, depression, aggression, agitation and with the early structural alterations that can be observed in the neuroimaging exams especially atrophy of the hippocampus.